31 w w w. s p i r i t o f w o m e n . c o m | W I N T E R 2 0 1 8 | S P I R I T O F W O M E N I f your child is literally not a team player when it comes to organized sports, is he or she destined to become a couch potato? Definitely not, say the experts. While travel teams and school sports may garner all the attention in the world of kid fitness, there are lots of simple ways to get children moving that don't involve uniforms and scheduled practices. Foot power The easiest way to get your youngster in motion is to have him or her "walk, bike, scoot, skateboard or pogo-stick to school" if possible, according to EveryMove, a Seattle- based wellness vendor. While research shows less than half of kids ages 6 to 11 (and even fewer adolescents) meet the federal government's Physical Activity Guidelines for Americans of 60 minutes a day, "just getting to school on their own can really help boost kids' daily physical activity, and it helps with their mental health as well," says Sabine Delouche, program manager for the University of Miami Miller School of Medicine's WalkSafe program. WalkSafe helps collaborate with community crossing guards, law enforcement and school district personnel to persuade parents to let their kids go to school on their own. "Parents will tell us, 'It's not the same as when I was a kid and used to walk to school…' as a reason why they don't feel safe letting their kids walk or bike to school," says Delouche. WalkSafe is looking for ways to combat those fears, creating more community walking routes and even a "walking school bus" program where parents volunteer to accompany a group of kids. "Parents are more willing to let their children go alone to school if they can coordinate with neighbors," she says. Family values Beyond letting kids get to school actively if at all possible, "it is up to parents to instill in their children that being active is what they need to do not just for their physical wellbeing but for their mind," says Bill Sells, senior vice president of government relations and public affairs for the Sports and Fitness Industry Association. Citing research that shows "this is the least active generation of children ever, which doesn't bode well for the future," Sells emphasizes that parents shouldn't "take the easy way out and let their kids be glued to their screens. Make physical activity a value in your family," he adds. Take a family nature hike or kayak around a local lake, go on a bike ride together, throw the ball in the yard, or just take a walk after dinner with the family dog. 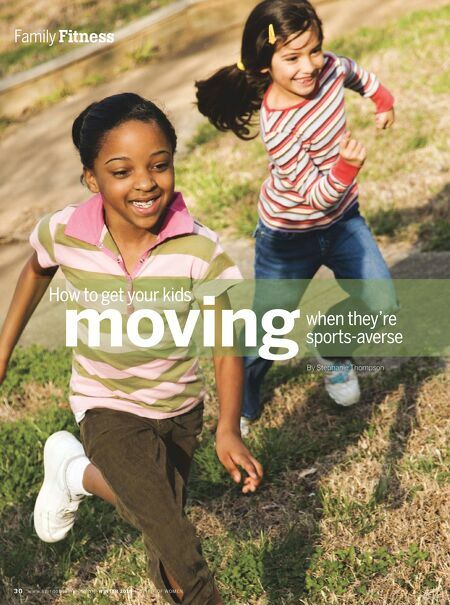 It's also crucial that you serve as a good role model for exercise and physical activity yourself, rather than treating it as a punishment or a chore, suggests "A Parent's Guide to Fitness for Kids Who Hate Sports," published by KidsHealth, a project of The Nemours Foundation. 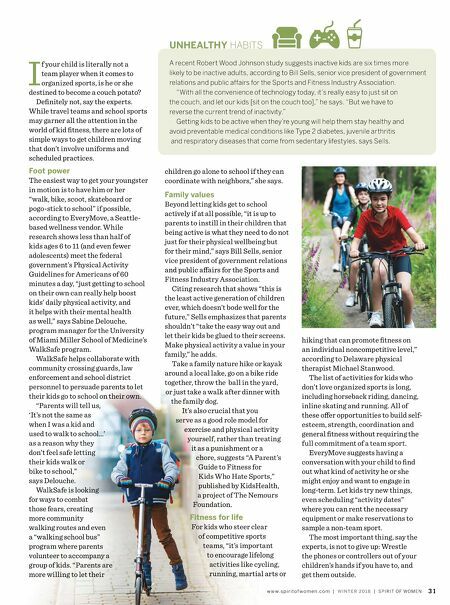 Fitness for life For kids who steer clear of competitive sports teams, "it's important to encourage lifelong activities like cycling, running, martial arts or hiking that can promote fitness on an individual noncompetitive level," according to Delaware physical therapist Michael Stanwood. The list of activities for kids who don't love organized sports is long, including horseback riding, dancing, inline skating and running. All of these offer opportunities to build self- esteem, strength, coordination and general fitness without requiring the full commitment of a team sport. EveryMove suggests having a conversation with your child to find out what kind of activity he or she might enjoy and want to engage in long-term. Let kids try new things, even scheduling "activity dates" where you can rent the necessary equipment or make reservations to sample a non-team sport. The most important thing, say the experts, is not to give up: Wrestle the phones or controllers out of your children's hands if you have to, and get them outside. UNHEALTHY HABITS A recent Robert Wood Johnson study suggests inactive kids are six times more likely to be inactive adults, according to Bill Sells, senior vice president of government relations and public affairs for the Sports and Fitness Industry Association. "With all the convenience of technology today, it's really easy to just sit on the couch, and let our kids [sit on the couch too]," he says. "But we have to reverse the current trend of inactivity." Getting kids to be active when they're young will help them stay healthy and avoid preventable medical conditions like Type 2 diabetes, juvenile arthritis and respiratory diseases that come from sedentary lifestyles, says Sells.